When the body fails, what then? From humble beginnings in the cool Alaskan bush, to struggling in Florida’s heat, George’s path eventually led him to Aroostook County, which he now calls home. 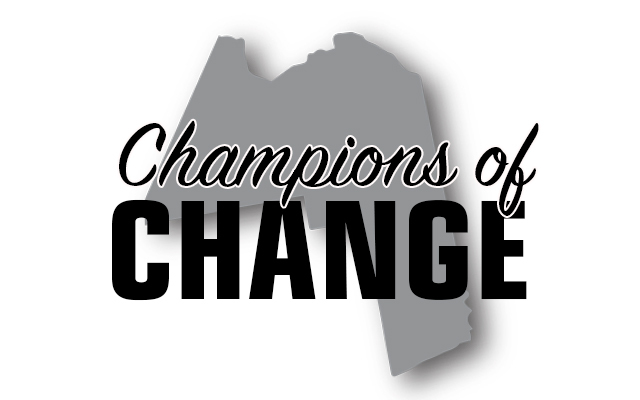 This column by the Aroostook County Action Program is meant to give a voice to people in Aroostook County who “Champion Change” — mostly in their own lives, but also in their community. Our hope is that by sharing real stories of people we’ve come to know through our “community action” work, that readers will experience some amount of change within themselves. George first entered the workforce at 16 years old. He struggled in school, but decades passed before he received a diagnosis for the learning disability that had hindered his reading and writing development. Still, he was a hard worker and learned well with hands-on instruction. When his body was healthy, he used it to earn a respectable wage that supported himself, his wife and their two children. When his body began to fail after decades of hard labor, however, George’s life changed forever. George never faced hard work he was unwilling to do. Over the years, he worked in various trades, did “tree work,” worked with sled dogs and horses, and drove long-haul truck runs. In his off time, he continued to push his body, living in the rugged Alaskan bush without electricity or running water and chopping wood to heat his home or the water he hauled to his remote location. As tough of a life as it may sound to folks accustomed to modern conveniences, the lifestyle choice suited George just fine. He appreciated the solitude and freedom his bush life provided him, and he was happiest when he was busy and hard at work. At nearly 50 years old and after more than three decades of pushing his body to its very limits to care for himself and his family, George suddenly faced needing help just to survive. His wife left him. His children, now adults, were pursuing their own lives. With his challenges in reading and writing, navigating the complex social services system was an overwhelming task. Alone, unable to keep up with his bush property, and fearing his ability to earn an income was nearing an end as his body began to deteriorate, George journeyed as far south as he could fathom, where he could live in a tent if need be without fear of freezing and dying in the Alaskan winter. He went to Florida. It was in Florida where George began his fight for disability. He had several herniated disks in his back and neck, was in constant pain and receiving steroid injections just to function. His doctors pushed for surgeries, but he needed money to eat and pay for mounting medical and legal bills. So, instead, he pushed himself through excruciating pain to haul garbage, further damaging his already battered body, until the day came that he literally couldn’t anymore. After six years, George finally received his disability, but ironically, it was his mind, more than his body, that earned him the designation. Because of his learning disabilities, coupled with his now physical limitations, the system finally determined he was officially unable to function in the workforce. With settlement in hand, George attempted to find a middle ground — something that would remove him from the stifling heat of tent living in Florida and give him some semblance of the life he knew and loved in Alaska. He relocated to Maine and bought himself a small, off-grid cabin nestled in the trees of Woodland. He hoped with continued medical treatment, he might be able to provide for himself with a small garden, but reality – and his body – quickly swept those hopes aside. Coming next in George Part II, George faces some of the misconceptions and fears that people have when someone chooses to live less traditionally in our society. He also is forced to make decisions in order to survive. Aroostook County Action Program administers more than 40 programs in the community that help people meet their basic needs and that offer support, education and encouragement. For information, visit our website at acap-me.org or call our office at (207) 764-3271.